Sharon E. Jones | Jones Diversity, Inc.
Get the strategies you need to chart your own path and achieve your dreams, regardless of your race, ethnicity, gender/gender identity, sexual orientation, or disability status. Sharon E. Jones is a trailblazer for diversity and inclusion in the workplace. Her book, Mastering the Game: Strategies for Career Success, is designed to level the playing field for diverse professionals in entry-level to mid-career positions. Standing out from the white male majority presents additional challenges in navigating workplace culture and gaining leadership roles in a variety of professional fields, including law, business, medicine, and technology. When you or your employees read Mastering the Game, you'll get practical guidance and more than 100 strategies on how to make a difference in your work environment and achieve your career goals in any sector. "Mastering the Game is like a treatise for career development. Jam-packed with honest advice that too often women and minorities do not get to hear, Jones teaches you skills you may not have known you needed and gives you actionable steps to start practicing them. " Sharon E. Jones is a lawyer, author, public speaker, and consultant who specializes in diversity and inclusion training for individuals and companies. As CEO of Jones Diversity, Ms. Jones helps organizations enhance their competitive edge by fully utilizing and retaining diverse individuals. She advises clients on how to create inclusive organizational cultures and promote diverse individuals into leadership roles. Ms. Jones has practiced law and been a community leader for more than 25 years. Over the course of her career, she has held positions with major law firms, with Fortune 500 corporations, and as a federal prosecutor. She has been highly successful as a litigator, counselor, educator, and problem-solver regarding extremely complex and sensitive matters. Most recently, she served as chief operating officer and executive vice president for the Chicago Urban League, an organization with over 75 employees and a $10 million budget. 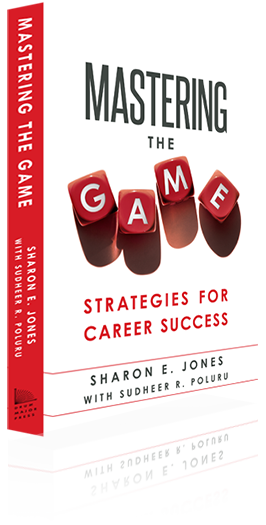 Ms. Jones decided to write Mastering the Game: Strategies for Career Success so that other people could avoid some of the pitfalls that she has experienced over the course of her professional life. She spent a long time searching for the perfect job before realizing that she could make any job perfect for herself. Over the years, she has trained and mentored countless other diverse professionals, and she is inspired by seeing these people achieve success and become agents of change. Contact Sharon E. Jones to find out more about Mastering the Game.